Simultaneous interpreting is an oral translation mode. It is called simultaneous interpreting because the interpretation and the speech happen simultaneously. You need the following equipment: one interpreting booth per language, interpreter consoles, microphones, headsets, a mixer, a transmission system, receivers with headsets. In a soundproof booth the interpreter listens to the speaker through a headset and simultaneously translates the speech into a microphone. After twenty or thirty minutes he/she alternates with a colleague. The audience in the conference room listens to the interpreter through the headsets of a receiver, selecting the channel of the language they want to listen to. Interpreting between two languages via a third is also possible: this mode is referred to as RELAY. When the interpreter does not cover the speaker's language (e.g. Portuguese), he/she (e.g. with language pair Italian > English) connects to another booth that does interpret from the speaker's language (e.g. Portuguese > Italian) and translates (e.g. Italian > English) from the colleague's interpretation. The use of a single language as a relay is called PIVOT. Simultaneous interpreting is called WHISPERED INTERPRETING when it is whispered in one or more speakers' ears which are sat nearby. 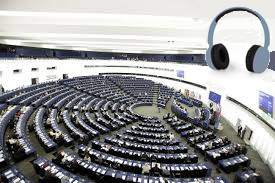 Another simultaneous interpreting mode is SIGHT TRANSLATION, that is the accurate rendering of a written text into spoken speech in another language. Sight translation is used when you want your written documents or forms in a language simultaneously translated into another language in front of an audience. WHAT IS OVER-THE-PHONE SIMULTANEOUS INTERPRETING? Simultaneous interpreting can also happen OVER THE PHONE, using sophisticated call center technology. For over-the-phone simultaneous interpreting there must be a high-quality connection from the phone line to the interpreting booth or system. WHAT IS VIDEO REMOTE SIMULTANEOUS INTERPRETING? Another simultaneous interpreting mode is VIDEO REMOTE INTERPRETING, which happens when participants are in different rooms and communicate via some web-based video technology. For video remote simultaneous interpreting there must be a high-quality connection from the video system to the interpreting booth or system. I can interpret simultaneously with a high level of accuracy, combining attention to detail, knowledge of linguistic nuances and high-level of expertise in your subject area. I render the original speech into another language instantly transforming cultural-specific references in a clear and calm voice. 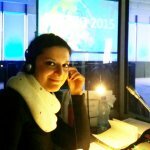 For VIDEO REMOTE SIMULTANEOUS INTERPRETING service I am active on the platforms Headvox and KUDO.